Description: This marble bust of the former Confederate general and North Carolina state senator, Matt Whitaker Ransom, wears a shirt with a high collar, coat, and suit. The bearded Ransom turns his head slightly to the left, appearing to look into the distance. 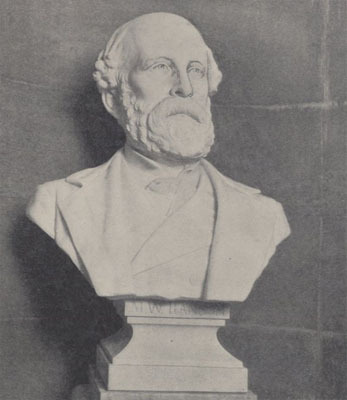 The bust was commissioned by the North Carolina Historical Commission and is situated in the rotunda of the State Capitol building in Raleigh, North Carolina. Sponsor: Hon. R.W. Winston (Raleigh Bar); North Carolina Historical Commission. Cost: $Between $900.00 and $1,000.00. Subject notes: Matt Whitaker Ransom (October 8, 1826 - October 8, 1904) practiced law and was the attorney general for North Carolina from 1852-1855. During the American Civil War he served as a general in the Confederate States Army. After the war, he was a Democratic U.S. senator from the state of North Carolina between 1872 and 1895. He later served as the ambassador to Mexico from 1895 to 1897. He died on October 8, 1904. Location: The bust is located in the southeast part of the rotunda inside the State Capitol on the first floor of the building. The bust of Matthew Whitaker is near a plaque, an open passageway into the rotunda, and the bust of John Morehead. Landscape: The bust is located inside the State Capitol building in Raleigh.